One major element of my work on religion and international relations focuses on religion and political violence. I argue that religious contention is distinct in its global focus and divine sanction, which can lead to more intense violence by combatants and greater concern by states. My recent work on this topic has connected it with another area of my research, the effects of ties between religion and state on politics. I have looked into the nature and effects of religious violence in a few works. In The Ancient Fire: Religion and Suicide Terrorism, in Terrorism and Political Violence, I used advanced statistical analysis to analyze how terrorist groups’ religious ideologies influence their behavior, finding that the framing of their actions through religion can lead to significant increases in the deaths from suicide attacks. Additionally, in Is all Jihad Local: Transnational Contention and Political Violence in Somalia, a chapter in Globalizing Somalia: Multilateral, International and Transnational Repercussions of Conflict, edited by Emma Leonard and Gilbert Ramsay. 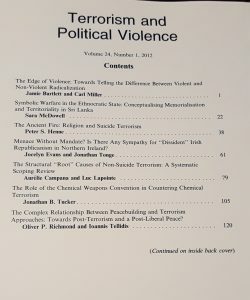 I applied Sidney Tarrow’s theories of transnational contention to political violence in Somalia to analyze the extent to which actions by groups like al-Shabaab have become transnational in nature. I have also examined the broader context of terrorism in an article–currently in revise and resubmit–that looks at whether Muslim states’ cooperation with America on counterterrorism actually helped them. I will post updates when this moves forward. More recent work in this area combines it with my research into religion-state connections. One exciting example of my work in this area is an article in the Journal of Conflict Resolution, co-authored manuscript with Jason Klocek (of UC-Berkeley). This article, “Taming the Gods: How Religious Conflict Shapes Religious Repression” uses quantitative analysis to highlight how religious conflict in a society leads the state to crack down on religious groups, as these groups appear more threatening in the light of the conflict. It is currently available in Online First form. Additionally, Klocek discussed it with the Research on Religion podcast, and we both talked with Sage about it. Additionally, I have an article in Religion, State and Society that examines the impact of government regulation of religious institutions on terrorism, such as Middle Eastern states’ monitoring of mosques. Contrary to some who argue this is an effective counterterrorism policy, I find that it can actually increase the threat of terrorism.